Welcome to The 19th Century That Never Was! It is a world of wonder, of horror, of adventure, of magic, of strange technology and unprecedented cultural revolution. This is the age that nearly was, filled with radium-powered flying machines, clockwork automata, and steam-driven computers. It is an age of dark magic, sinister secrets, and unholy cults. It is a time in which the world teeters on the edge of disaster, where the enlightened scientific mind battled against ancient superstition and ignorance, in which the souls of all mankind hung in the balance. A comprehensive and immersive campaign background detailing the fantastical Victorian world of The Widening Gyre. -Character archetypes to play a wide variety of 19th century adventurers − Airship Pirates, Clockwork Men, Consulting Detectives, and more! 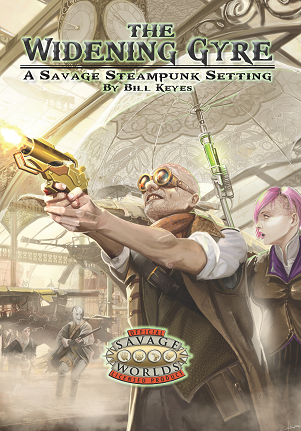 -Rules for wild steampunk technology and sorcery, including weapons, armor, vehicles, bizarre Victorian devices, and magic spells. -Full stats for dozens of characters the heroes will encounter on their journeys, ranging from helpful allies to evil technologists to monstrous beasts from a darker era. -New Skills, Edges, and Hindrances. -A full bestiary with over 40 monsters and opponents. -A fully detailed campaign, six full adventures, and four variant campaign ideas. -Nearly twenty Savage Tales, a dozen one-sentence adventure ideas, plus an easy-to-use adventure generator to help put together quick adventures on the fly. -Enter a world of adventuring daredevils and academics, occultist thrill-seekers and Savants both heroic and insane, in which a secretive organization of benevolent technologists seeks to prevent the dark monsters of humanity’s past from overwhelming its bright and burgeoning future. They are. My copy is beautiful and perfectly legible. If you already bought the print copy and yours was one of the botched printings, then contact BlackWyrm Games for a replacement. As far as I know they are replacing the faulty copies primarily on their own dime (You probably have to pay shipping at the most). POD question - I've had the POD book for over a year now and just pulled it off the shelf again and was immediately reminded why I haven't read this through or used it more often. The PDFS don't generally have this issue, but in the POD book, the stylized gears border is black on white rather than a light grey-scale and ends up blocking out text on almost every page, rendering the information incomplete and unreadable. Was this a common issue, or something specific to my printing? If the latter, I can reach out to customer service. I had just chalked it up to poor layout and not transferable to Print, something I've seen with a few digital publications. Anyone know the dimensions for the POD off-hand? Are they the travel size that so much of the SW stuff is printed in or 8.5"x11"? You can ignore my absurdly silly question above. For anyone as blind as I am, if you select the option that includes the PoD book it tells you the dimensions. Will this be receiving an update to include Bookmarks for sections in the document? It already has by the time I purchased it, though in the form of a second PDF bundled with the first. The PDF with bookmarks should be "WideningGyreSW3.2-3X.pdf"
The 3.2 probably refers to version number, the 3X may be image resolution or something else. I'm curious what the number scheme on it is myself. I've recently purchased the PDF of this product, and would like the front and rear covers to go with it. Any chance that these can be added to the PDf as an update or as a separate free download? We attached the front and rear cover to the download here at RPGNow Alan. You should be able to download it. Thanks for making it a separate download instead of messing up the page numbers inside the PDF! I just received my POD soft cover. Although it's a nice product, it's also unusable. The faint gray border of gears in the PDF has been turned into a solid black in the printout. I'm not sure if that's a setting or a printer error, but it completely blacks out some of the text. For what it's worth, I find the border distracting in the PDF, but not to the point it's unreadable. Phil, I'm hoping that is a one-off printer error, as DriveThru just had Bill and I update a bunch of the print files. In any case: email me at sales@indiepressrevolution.com with your address and I'll ship you a copy out of the stock I have here. Why was there no cover to the PDF? It just starts with what I assume is the inside page. I like the artwork you display as the cover page in the item description. Hello Josiah! Yes, if you're building the character from scratch, Arcane Background (Weird Science) is required before you can choose that knowledge. Thanks for asking! I don't know if this is the right place to ask about it, there do not seem to be any official forums on the publisher site. But the Kn (Savant Tech) mentions that only those that take the Savant Character package can take this skill. what if a character is built from the ground up? Is the limitation rather Arcane Background (Weird Science)? This is fantastic! Any chance of a PoD version?